Centrum Wiskunde & Informatica: Some Algol plotting procedures : 3rd ed. Some Algol plotting procedures : 3rd ed. 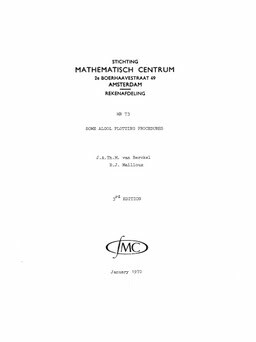 van Berckel, J.A.T.M, & Mailloux, B.J. (1970). Some Algol plotting procedures : 3rd ed.. Stichting Mathematisch Centrum. Rekenafdeling. Stichting Mathematisch Centrum.